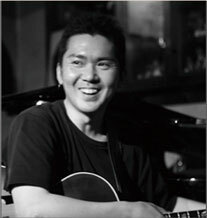 playing guitar at the age of 15.
entering college, he joined a jazz group and started playing jazz. White, Chris Hunter, Lew Solof, Chip Jackson. where he teaches jazz guitar & music theories. has traveled back to New York constantly ever since. 2004 Released his first album as leader ‘Light up the Sky’ and followed up by his tour in Kyushu, Yamaguchi. He built a greatreputation from the tour. 2008 Recorded his second album ‘The Starting Point’ with Joe Martin on bass and Bill Stewart on Drums at the Clinton recording studio in NewYork. 2009 The starting point tour 2009, Invited New York based bassist Matt Clohesy and drummer Mark Ferber and toured several cities in Japan. 2010 With Akiko Grace on piano, Matt Clohesy on bass, he made a successful concert at Soyokaze hall. 2012 Produced his third album ‘Respective Destiny’ with Danny Grisstt on Piano, Matt Clohesy on bass and Mark Ferber on drums recorded in New York. He currently performs mostly his original tunes and his own arrangements of standards with his trio besides solo, duo and his quartet performances. He plays his own straight ahead jazz sounds in his contemporary playing style. Copyright © 2019 Shusaku Yamano. All Rights Reserved.